For traditional retailers, existing alongside Amazon on the internet is getting tougher. The big picture: Amazon is gobbling up Google search results for companies even when users search specific key words related to those firms, market research firm Gartner L2 notes in a new report. What's going on: When you search "ethan allen recliners," the first result that comes up may not be Ethan Allen, but Amazon. 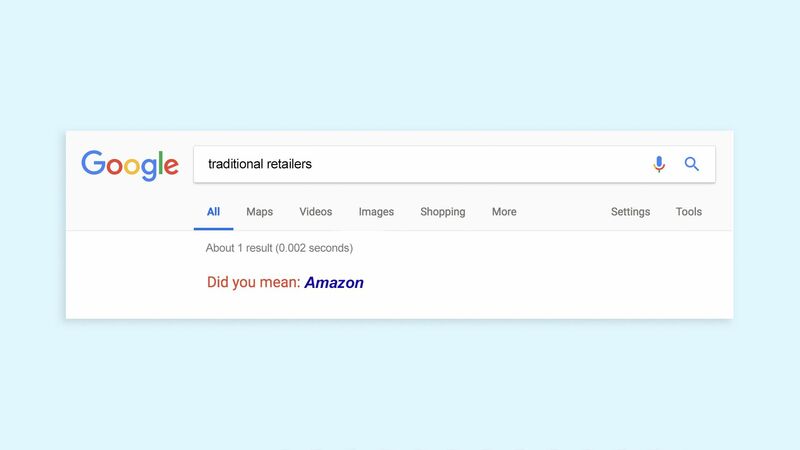 That's because Amazon is buying Google ads against these customer search queries, forcing retailers to buy ads, too, says Griffin Carlborg, the lead author of the Gartner report. Amazon is popping up for 23% of Ethan Allen's search terms, 32% of Ashley Furniture's terms and 47% of HomeGoods' terms, per Gartner's analysis. The report found that Amazon owned 15% of a sampling of 1,353 search keywords representing businesses ranging from sporting goods to home appliances. Amazon wins half of this 15% with the sheer power of its own brand, and it pays for the other half. The bottom line: The Amazon effect is changing companies from top to bottom, influencing their decisions on everything from how much they pay their employees to what they spend on Google ads.